CHARLOTTE CELEBRATES THANKSGIVING | South Charlotte Newcomers! Charlotte is a Thanksgiving cornucopia of fun and relaxation! The Queen City offers friends and families great opportunities to enjoy the hospitality of Charlotte and give thanks for all the wonderful blessings! Charlotteans loves a parade! 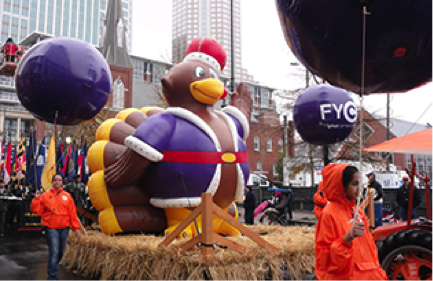 The 65-year-old Charlotte Thanksgiving Day Parade was perilously close to not happening in 2013 due to withdrawal of a long-time sponsorship, but such a true Southern tradition was not to be let go easily! Thanks to the support of Novant Health, the parade will be marching in Uptown on Thanksgiving Day! The beat of marching bands, the beauty of the decorated floats (and the beauty of the reigning Miss North Carolina), performers, and dance and drill teams will fill the streets of Uptown Charlotte lots of family fun!The parade begins at Tryon and 10thstreet, and will march to Stonewall Street. The fun begins at 9:30 am! After the parade festivities in Charlotte, Thanksgiving revelers can continue to enjoy Uptown by going to their nearby turkey meal reservations! Restaurants like Blue Restaurant on the corner of 5th and College Street are open for hungry patrons. Blue is offering a Thanksgiving brunch from 10:30am to 2:30pm that will be sure to satisfy the traditional turkey lovers and the non-traditionalist palates! Also Uptown, Mimosa Grill is offering a Thanksgiving buffet with free-range turkey from 11am to 5pm. Mimosa Grill also has the option of Turkeys On The Run. Turkeys On The run is a full dinner including all sides that can be picked up on November 27th after 4:00pm, or on Thanksgiving Day 8am to 11am! Mimosa Grill is located at 327South Tryon Street and has you covered in house or to go on Thanksgiving! When driving home after the parade excitement finds you heading to one of the great neighborhoods on the South Side of Charlotte, just a short drive down Providence Road is Red Rocks Café! Located on the corner of Fairview and Providence Roads, Red Rocks is an upscale dining experience in a comfortable, relaxed atmosphere. A delicious Thanksgiving buffet will begin at 11:00 and last seating will be at 8:00pm. Further South, Ballantyne Hotel and Lodge is offering a Thanksgiving brunch from 12pm to 4pm. This upscale lodge is always a crowd pleaser with its wonderful buffet and incredible service! Also in the Ballantyne area, Villa Antonio continues its tradition of serving people their amazing Italian fare, as well as offering a special Thanksgiving menu, on Thanksgiving Day! 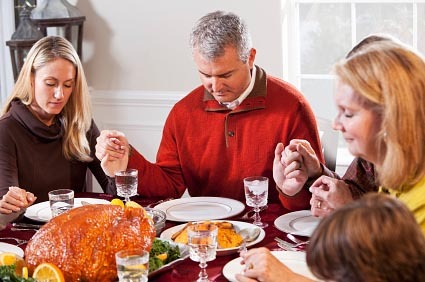 Villa Antonio is located in Ballantyne Village and will be open 2:00-9:00pm Thanksgiving Day. Entertaining family and friends is always easy in Charlotte and even on a holiday, Charlotte will keep your visitors thankful for your amazing hospitality! The Charlotte South Park Turkey Trot is bright and early on Thanksgiving Day! The entire family can join the fun at 6:00 am for a 1-mile fun run, 8k run, Baby Jogger 8k, 5k or Tot Trot. Ballantyne is also hosting a fun run! Ballantyne’s Turkey Dash will be at the Village at Robinson Farms on the corner of William Ponds lane and Rea Road! A four-mile run starts at 9:00am or, if the family is more into walking, a one- mile run (or walk) starts at 8:30 am on November 28th. The Charlotte Motor Speedway is welcoming Christmas on Thanksgiving Day with Speedway Christmas! See over three million Christmas lights while driving on the track and enjoy the Christmas Village complete with live animals, Santa photos and vendors on the infield. The holiday spirit will be celebrated at the Speedway 6:00pm-10:00pm. NASCAR fans can also visit the NASCAR Hall of Fame on Martin Luther King Jr. Blvd. for WBTV’s Holiday On Ice. Ice skating will be a wonderful treat, and new family tradition for the family Wednesday-Friday, 5pm-10pm and weekend hours at the outdoor rink in the heart of Uptown! Charlotteans are thankful to be living in such a fine city where we can proudly welcome family and friends! Happy Thanksgiving everyone! Visited Speedway Christmas the Friday night after Thanksgiving. It was a huge disappointment! Not worth $20. It did not merit any oohs or awes, and we never saw a “village.” We were slowly, very slowly, escorted in and out. That was it!